If the governments of the largest GHG emitting nations had the vision and the mandate of the low-lying Indian Ocean nation, The Maldives, we’d be already be aiming towards a different world. The Maldives President, Mohamed Nasheed, announced a plan for that country to become carbon neutral within a decade. If the rest of us followed that example, we’d be aiming for a world in which CO2 levels at the end of this century would stabilize near 350 ppm, rather than still be rising past the 900 ppm mark as they would under “Business As Usual” or the 730 ppm-mark as they are expected to if governments aren’t able to offer more than the current proposals under discussion around the planet. (see our previous post on these proposals). Nasheed hopes his country’s plans will serve as a blueprint for the rest of the world. What if that happened? What if we left it to the islands states and the young people of the planet to negotiate the deal in Copenhagen and the goal of the Maldives became the goal of the whole planet? What would the implications be? 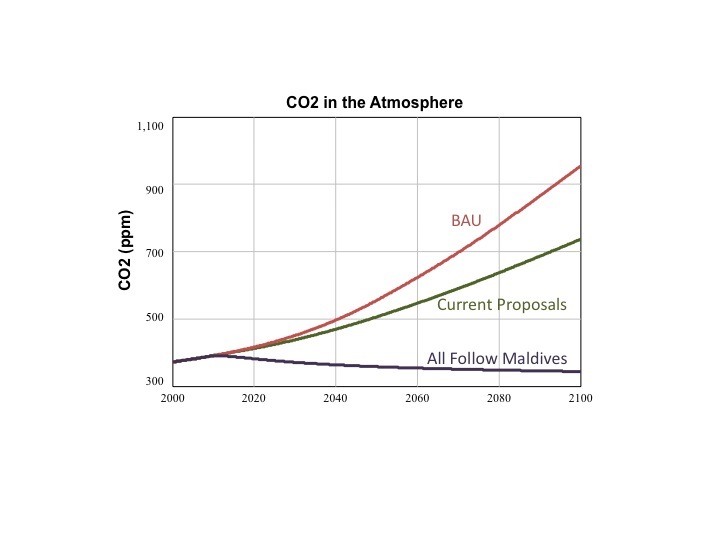 The results don’t prove we could accomplish this speed of decarbonization, and they don’t show that the Maldives could either. What they do show is that, were the whole world to set its sights on this level of ambition, we’d be aiming where we need to aim if our goal is a world with a climate something like the one to which we are accustomed. For a nation at sea level there is, of course, no other place to aim. And, on this interconnected interdependent planet, the goals of the most vulnerable, sooner or later, will become the goals of all of us.